2004’s Ghostbusters: Legion sold well enough to warrant a second printing. And, to mark that issue, it was printed with an all-new cover. 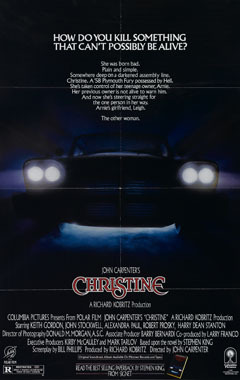 This one paid homage to the movie, Christine (which was based on the Stephen King novel), by depicting the Ghostbusters’ Ecto-1 in the same pose as the 1958 Plymouth Fury in the Christine movie poster. 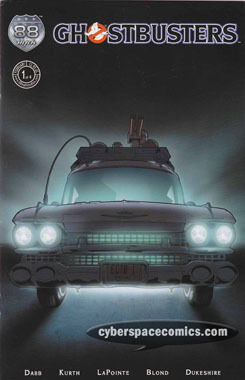 Curiously enough, there is an ad in the back of Ghostbusters: Legion #3 for a die cast replica of that very same car! Yeah, publisher Sebastien Clavet had said next to Ghostbusters, Christine was one of his favorite movies. Legion was a great book and would have been a good lead into an ongoing. Unfortunately, 88MPH mucked it all up.